This is a quick update on my previous post about the STRP festival. Apparently, the technology expo continued at night, so I was able to see some of the demonstrations anyway. I wanted to share a few of them just to give an impression. 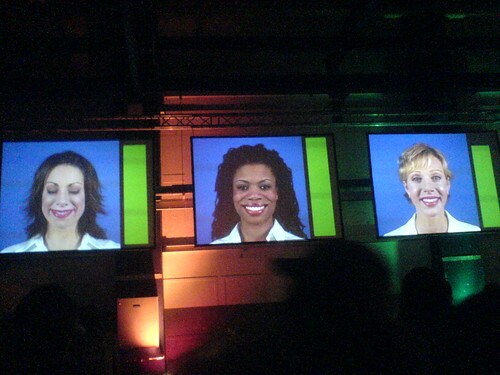 There were a set of large screens mounted in the expo that displayed a video of a woman’s face together with a power meter. When the lady smiles (no pun intended) , the power bar is green and filled to the top. When she stops smiling, it drops to the bottom and turns red. It took me a while to get the meaning of this power meter since the women only stop smiling once in a while There is a video available that gives some more details. I also had the chance to experiment with the i_AM table which was not very impressive in my opinion. 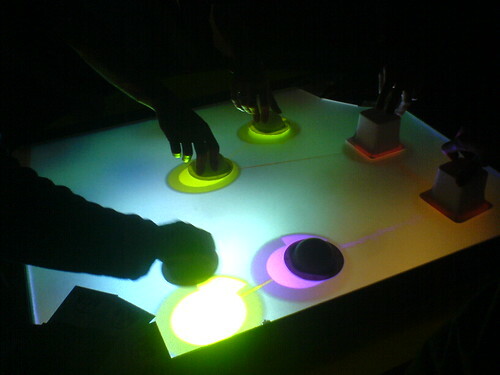 Although it was definitely more simple than the reactables table, as a consequence it did not offer much functionality. Each object that was placed on the table was linked to a sample (e.g. a guitar loop) with a certain volume depending on its position on the table. When an object was pushed up or down on the table, its volume changed from loud to quiet. When it was moved to the left or to the right, it would become linked to another sample. When you turned an object, the portion of the sample that was repeated could be altered. I did not find the mappings logical, but then again the problem with these kinds of systems is that there has to be a way for the user to find out about the object’s affordances. This can be done by using objects that represent their affordances explicitly, or by displaying something helpful next to the objects. The i_AM table did not offer a way to find out about an object’s functionality.